We see donation buttons on the internet all the time, from Wikipedia to WordPress plugin sites. This feature is very helpful especially if you are looking to fund for projects or raise awareness. Recently, I discovered a cool tool called Ko-fi and in this week’s tutorial, I am going to show you how to create donation on a website in just a few simple steps. Ko-fi is a little online gadget created by Nigel Pickles that enables readers to donate to your website through a link. Interestingly, this link comes in the form of a button that reads “Buy Me a Coffee” and I think it’s a nice way to ask for donation without being too obvious about it. How to Create Donation on a Website with Ko-fi? First thing first, you need to set up a PayPal account because the donation will be directed to there. Using the same email address, go over to Ko-fi.com to key in the details as follow. You can customize your request and change the color of the button. When creating the button, you have two options of publishing – share the donation link on social media/email OR copy the HTML code and paste is on your website such as WordPress or Squarespace. The button will then be shown on the front end of your web page. When someone clicks on it, it will bring them to a message board where they are given the option to send you a personal message. When they click on ‘Buy’, it would lead them to a PayPal page for them to complete their payment. As you can see in the example below, it only costs $2 for readers to ‘buy you’ a cup of coffee. Ko-fi is a free tool to use. Whenever someone donate $2, you get a full sum and Ko-fi does not take any cut from it. What Other Donation Button Can You Use? Alternatively, if you already have a PayPal account, you can actually use their famous ‘Donation’ button which is available at the merchant services. I am pretty sure you have seen those yellow buttons around. Well, it works just the same way; embed the codes on your site, just like the Ko-fi button. Another way is to use a WordPress plugin called “Support My Work”. It is more customizable and links to a PayPal payment gateway. And oh, if you don’t like coffee, there’s also another plugin called “Buy Me a Beer”. However, it was last updated in 2013 so I would recommend that you test it out first before using it on your site. What Can Donation Button Be Used For? Donation buttons can be used for a lot of charitable ideas. Out of curiosity, I checked out Google Suggest and found that many people are looking for donations in these situations. Of course, you aren’t just limited to these ideas. Here are other things that can benefit from a donation button as well. However, if you are running a bigger project campaign and need bigger funds (more than just $2), I would suggest you check out how to do fundraising with Indiegogo. That platform will allow you to give something back to people in exchange for their donations. How Effective Is a Donation Button? Well, that really depends on the cause of donation and how good you are at reaching out to your audience. Simply asking people to click a donate button will not work unless you provide good information that gives them a reason to trust your work. For example, if you are asking for donations for animal rescue related work, then you should write a blog that describes the timeline of your progress and show some success stories so that readers know you are committed to the cause. In addition, if you share your blog post frequently on social media, you can give your blog more exposure and get more people to respond to the donation button. So, What Is The Difference That You Want to Make? Having some extra money can make a lot of difference in a cause that you want to support. You can use it to buy a lot of coffee, grow a community or simply put smiles on other people’s life 🙂 What are the things that you think can be improved with these donations? Create a website and blog about it. If you don’t know how to set up one, head over to the SiteRubix platform and I’ll walk you through the process. Do you have any thoughts or questions about how to create donation on a website? Feel free to leave your comment below and I’ll get back to you. Yes, I have seen those yellow donation button by PayPal but never thought of implement it to my website. This article is an eye opener! Yes, we bloggers offer valuable information to our readers and it could be reasonable (or at least doesn’t appear odd) that we request for donations. I’ve never heard of “Ko-fi” but will definitely look into it. I appreciate that you share this information with us. Cheers! I guess if your niche is supporting a good course or producing some creative work, placing a donation button is viable. Either way, you want to be transparent about how you are making use of the fund to gain trust from your readers. Hey, I’ve often seen those “Buy Me a Coffee” buttons on websites. One that immediately springs to mind is a photo site called Pixabay, where you can get free images, but you have the option to leave a donation if you want to. I wonder how many people do in fact leave donations on sites that have these buttons. Any idea? I wouldn’t have any idea but there’s a stock photo site that I really like called Unsplash and they offer some really awesome image collections for free. I have donated to them a few times because I think they deserve to be rewarded for their hard work. First I want to start getting a good amount of traffic and be an authority in my niche. It’s not cheap to do a thorough product review. If I can get others to help donate to have more products to review, it’s a win-win for everyone that checks out my blog, right? And I mainly use PayPal, so do you think I should go with a Paypal donation? Thanks for the info. While there’s no harm to place a donation button on your website, you might want to do it without looking too cheesy. People visiting your site might get the wrong impression. Besides, readers usually want some kind of perks when they do donation online so that’s something to think about too. I think it’s far better to share the donation link with close friends and families who know that you are a start-up looking for some financial support. These people know you personally and are more likely to chip in to help you succeed. PayPal has a more professional look while “Buy Me a Coffee” feels more buddy-like. I think both works just fine. I had never considered adding a donation button to my site before but I can see why in some cases, it could be quite suitable and a good idea, especially of your site supports a charity or special cause. However I can imagine if you don’t support a cause and just want to raise funds for yourself, it probably wouldn’t be well received by readers? What do you think? I guess it really depends on how the writer present his/herself through relevant content. If you have the chance to look at how donation websites operate on crowdfunding sites like Indiegogo, you’ll discover that marketing plays an important factor, whether it is public or personal. The main point is, how do you make yourself worthy enough to accept a donation? Are you providing them anything useful in exchange for their contribution? If you can connect the answers to these questions, I think you will be able to get support from your readers. Loving your Ko-Fi guide you’ve laid out here! I believe this is much better than the old donation button as you won’t make yourself look desperate and its a catchy way for people to give pay tips if they love your work. But again. This will definitely be great for my photography website that I’m building for a friend, thanks for sharing this! Kofi wouldn’t generate a lot of funds and yes, it’s more like a tip than the typical PayPal donation button. But it’s something that would make a photography site look interesting. I mean, we all know how passionate photographers are about their work so giving them a tip or two is a great way to encourage their creativity, I think. Oh thanks so much for this Cathy – I run a geek horror film website that has a lot of subscribers – maybe it’s time I got something back from them all lol. I like the way it doesn’t seem to beg – getting you a coffee is a nice way to nudge people. Is it easy to implement into a wordpress sidebar? Just grab that HTML code and add to your text widget on the sidebar of your website. It should show up, at least it works on my SiteRubix testing site. What’s the name of your website anyway? I am not a big fan of horror, but who knows, your site could change my mind :). I think that this is a really cool idea. I have seen this before, but never knew what it was for. I have a friend who’s husband is going thru some major medical stuff. I am thinking about setting up a buy me a cup of coffee for her. I like it that its free and will definitely look into it. Thanks. Sorry to hear about your friend’s situation. By default, Kofi only donates $2 so if it’s medical related, I am guessing that you are dealing with a bigger financial goal here. I would suggest that you have a look at Indiegogo Life, a crowdfunding site that caters for worthy causes. Crowd sourcing can provide for higher donation volume and I think that might be a better alternative for your friend. This is such a good idea. I donate 10% of all my profits to Animal Rescue Organizations. My favorite is Animal Rescue Site, A.S.P.C.A, and Humane Society. This would be great. I love the idea. If my visitors like my content, they probably would buy me a cup of coffee. I will put this on my site. Wish me luck. I love what you are doing for your site. Both my dog and cat are rescued pets, so I know how much it takes to make them well and give them a new home. If you are always producing good quality content on your blog, I am sure the readers will appreciate your effort and do their bit to support you. 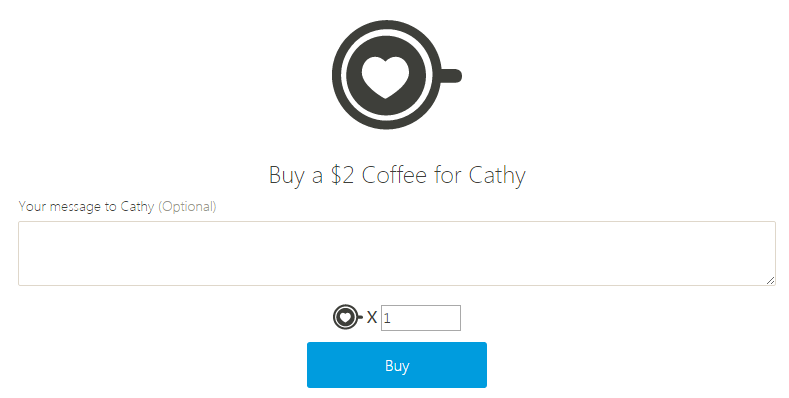 Hi there Cathy , another interesting article.I have seen this “Buy me A Coffee” button in many places around the web lately. I think a lot of designers , photographers and other artists use it. And you say it is a free option , that is really awesome.But do you think it is a good idea for affiliate websites?…My niche is the “make money online”….If I decide to include such a button where do you think it should fit better?…In the main home page or inside posts? I enjoyed this quote from Audrey , never heard it before. Great to hear from you again Tasos. I think putting a donation button in a ‘Make Money Online” website can make you look suspicious in the eyes of the readers unless you are supporting a certain cause that’s relevant (I know some people will disagree with this). If I really want to add it to my site, I would probably place it within a post instead of the homepage because donation is not my main marketing plan. However, say if I am a designer looking to raise fund to launch my product, I would place it on the sidebar where it would be more visible OR create a fundraising campaign on crowd source sites like Indiegogo. I’ve not heard of Ko-Fi before, although they’ve made the logo cleverly familiar (like most Wi-Fi logos). What a great concept though, I have seen the “Buy me a coffee” thing once or twice before. I’m a bit more familiar with PayPal’s “Donate” button. I would associate that more with making donations to charity though. If I was asking people for funds towards my own site, I would feel more comfortable using the “Buy me a coffee / Beer” wording. It’s less begging bowl, more ‘be a pal’. If you want to ask people for a donation, do you think it would look bad alongside affiliate links and banners? I guess I’m wondering if it’s morally wrong and would look money grabbing to have both. Welcome back to my blog, Tony. Placing Kofi next to banners isn’t really a bad thing, but depending on what niche you are in, it’s best to keep the context relevant. For example, if someone who does affiliate blogging for pet products is looking to support say, rescued pet neutering campaign, then I don’t see why she/he can’t use Kofi to leverage from the online traffic. Of course the blogger has to make it publicly clear that she/he isn’t earning anything from the donation. As long as you keep the blog content relevant and people like what they read, you might have a better chance of getting some donation. This is a nice little feature to put on your website. Its discrete and simple.How do you think people respond to this? I mean, do you think it’s something that will work for any niche or just charities and the like? I feel as if people just pass through them. I’m not saying it’s useless because if you get any money it’s already good, and it doesn’t take much effort… What do you think? Besides charities, I think it’s appropriate for start-up websites that are looking for funds to launch projects or products online. If your niche deals with that, then it’s a great tool to use. To get people to notice any form of donation site, you really need to work on a good marketing campaign instead of relying on a single tool. It takes time for people to be aware and trust you before they are willing to contribute their money. Or least that’s what I think it should be. If you like to learn more about raising funds online for a good cause, please read this post for more information.